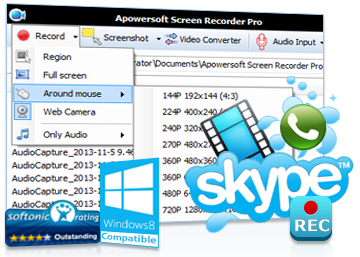 Apowersoft Screen Recorder Pro is powerful &amp; professional desktop screen capture software helps you record a video tutorial using the screen and audio activity running of your Windows system’s Desktop and export to standard WMV formats which you later convert into AVI, MP4, FLV, and SWF or any other formats without any quality loss using built-in converter. Apowersoft Screen Recorder Pro supports recording screen and audio activity synchronously that’s why it becomes now very easy to capture video games on PC screen. You can record your PC screen activity with audio, capture webcam videos with high quality, record video from external devices, even record live streaming video from any web browser. It supports recording screen video through a webcam which is available for Skype, MSN, and GTalk, It is an excellent assistant to record any live streaming video from Twitch TV, BBC, CNN, and Livestream, as well as many other live video websites. There is options to instantly play what you’ve recorder and convert as well, to all common popular video formats such as such as AVI, MP4, FLV, SWF, 3GP, MKV, and MPEG or populer devices like Apple, Android and Sony with personalize customization and instantly edit recorded videos: Crop, add subtitle, Trim, add effects, adjust contrast, Brightness, saturation and more. Using it’s powerful converter you can also convert video from your HDD too. Capture Screenshots is another cool feature in Apowersoft Screen Recorder Pro you should use to capture high quality images or screen activity in standard image formats like such as JPG, PNG, BMG, GIF and TIFF and best feature is you can instantly edit them with standard photo editing tool like pencil, circle, box, Drawing, highlight, and add stunning effects to screenshots. You can also schedule screen capture in specific time in full screen or or customon mode where both the video and audio or only audio can be recorded. Apowersoft Screen Recorder Pro is normally priced at $39.95 per license code, and to celebrate the Christmas & New Year, Apowersoft launched a special giveaway activity only for next 24Hours where you can get genuine software with official serial key fore free during giveaway period. Some discount offer’s are also included. This is a must have and very very very important software for every Windows users so don’t think about miss this giveaway. You have 20 Hours or less to collect the code from limited time Giveaway page. You need to share the giveaway via social networking site to unlock giveaway app and enter you full name and email id and press ‘Get it Now‘ button, now check email id and save registration code. Open software give registered email and serial key to fully activate software in time.